A full-scale JWST sunshield membrane deployed on the membrane test fixture at Mantech, Hunstville. 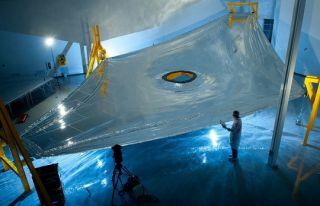 The JWST sunshield comprises five of these layers, each of which has to be precisely spaced with respect to the next. NASA's newest space telescope project has stayed alive despite a ballooning price tag that now stands at $8.8 billion. But whether or not the James Webb Space Telescope survives into the future may depend upon how well it can maintain the broad political support that helped past "big science" projects ultimately prove successful. One hopeful example comes from the Hubble Space Telescope that the James Webb Space Telescope is scheduled to replace. That telescope required $10 billion over two decades after early cost overruns and spacewalk repairs to fix a defective mirror in orbit, but still maintained strong support from both scientists and the U.S. Congress despite all of its troubles. "For big science on the scale of megaprojects, the support of scientists is necessary but the historical record argues it is not sufficient," said Robert Smith, a historian of science at the University of Alberta in Canada. "Big science raises big questions and strong support from outside of the scientific community is needed to sustain a megaproject over a long period." Not all "big science" projects have been as lucky as Hubble. U.S. physicists once dreamed of building the Superconducting Super Collider, a huge particle accelerator in Texas that would have been bigger than the famed Large Hadron Collider in Switzerland. But the SSC project failed to become reality because its support never grew beyond a small community of scientists, Smith pointed out during the annual meeting of the American Association for the Advancement of Science in Vancouver on Feb. 18. Such support proved incapable of keeping SSC alive when the political winds shifted against it — even after $2 billion had already been spent. "The SSC, it seems to me, never had a very broad base of support outside of the high-energy physics community," Smith told InnovationNewsDaily. "Hence, when the political climate changed with the end of the Cold War and the great concern about federal deficits in the early 1990s and the relative loss of influence of Texas in Washington, D.C., and when the SSC budget increased, the SSC advocates were unable to beat off the attacks." Some of the scientists who spoke out against the SSC even included Nobel Prize winners, Smith said. By contrast, the Hubble Space Telescope did not face much public criticism from scientists before its launch. The James Webb Space Telescope may have the funding to move forward, but it faces tougher criticism in a time when its costs cut into the budgets of other NASA programs such as robotic planetary missions. Some scientists have already criticized it for taking up so much of the U.S. space agency's resources. Still, Smith seemed cautiously optimistic when asked about the chances for the James Webb Space Telescope to successfully launch as the next big science project. "JWST is still several years from completion, but at this stage it does seem to have a strong coalition of supporters, which will be necessary to maintain," Smith said. "But ask me this question in five years!"